On the morning of day 7, we walked inside the largest apple in the Southern Hemisphere. 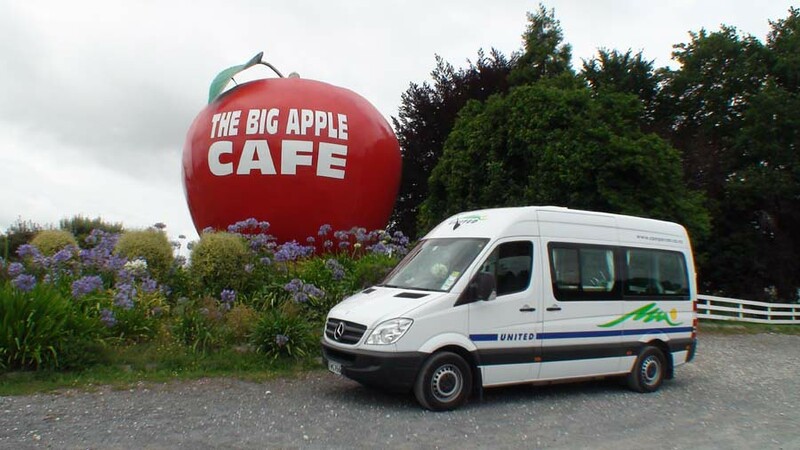 We found The Big Apple Cafe in the Native Parks guidebook. They’re a Native Parks host, so we could stay in their carpark overnight for free. We met one of the owners in the morning and he greeted us in a few different languages. I asked him how he knew so many languages. Since we’ve been here 15 years, we get quite a range of clients, like, from Japan, Korea, Chinese, Thai, European … so I just pick up a few words. And I’ve always been interested in languages. So just, yeah, I just pick it up and write it down and yeah and then just keep practicing and build up a vocabulary. As well, with our staff, we employ a lot of seasonal staff, like, people on working holiday visas. So it’s a good experience for them because they get to learn English and have a job. And it’s good for our us too because we deal with a lot of different tourists and we get busloads from all over the world so it’s good for our business and it’s good for them. So we have staff from Japan, Korea, Philippines, Fiji, Germany, Czechoslovakia. So they just come in and ask for a job and if there’s a vacancy, we’re more than happy to look after them. Arnold’s parents are from the Netherlands and he speaks a bit of Dutch. He also studied Māori for a few years. I asked him about the local Māori dialect. This area’s Manipoto-Tainui. So, like, to say How are you, normally around New Zealand you’d say … kia ora is quite a common word, it means hello and thank you in Māori. 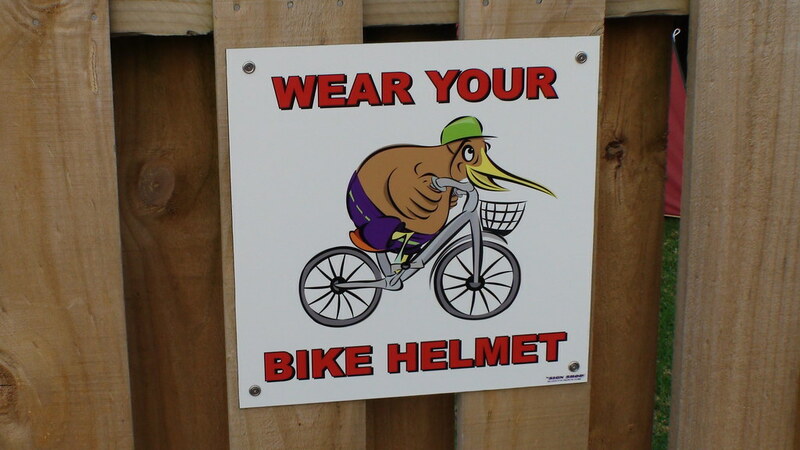 And around New Zealand, you’d say Kei te pēhea koe? which is How are you? But in this area we’d say E pēwhea ana koe? So it’s a slightly different dialect. We headed to towards the coast on State Highway 3. It started raining for the first time on our trip. We drove down a little road to try and find some rocks called the Three Sisters. But we couldn’t seem to see any rocks that looked like sisters so we gave up. We did see a cute little Pōhutukawa tree though and lots of jandals on a fence. Later on I looked up the Three Sisters and I found out that you actually have to wait until low tide to be able to walk around the coast to see them. And you can actually only see two sisters now. The third one seems to have gone for a swim. We saw two little cows head butting each other. We weren’t sure if they were playing or fighting. Coming up is the White Cliffs Organic Brewery and Brew Haus. Tourism Radio helpfully let us know that there was a brewery coming up so we stopped and bought some beer. Before we arrived in New Plymouth, we drove through a small town called Waitara and saw lots of murals. 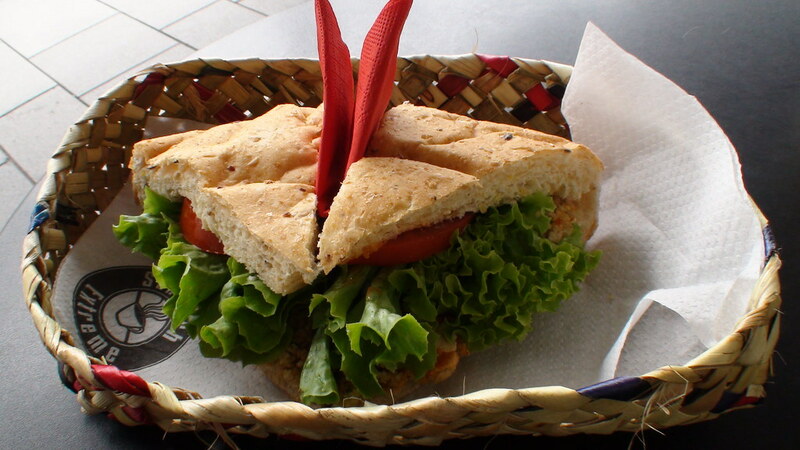 In New Plymouth, we had a sandwich for lunch. We went to the information centre to buy a postcard. 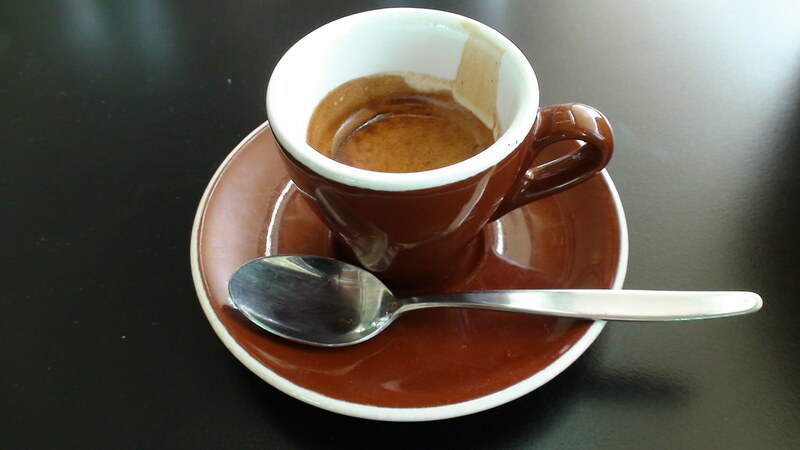 We had a coffee next door to the information centre. And then we went and checked out the Coastal Walkway. The Coastal Walkway’s a 10km path along the sea. It’s so cool. An friend of my uncle’s opened a surf shop in New Plymouth recently. So we went to visit him and check out the shop. I met BC when I was a little kid, but I hadn’t seen him since then. He’s originally from California in the United States. San Clemente’s where I grew up at and spent most of my life. And then I travelled here in 1976, so I spent three months travelling around New Zealand as a teenager and then quite liked it and came back in the 80s and then I came back in the 90s and then I talked my wife into moving here in 99 so I’ve been here ever since. BC’s been surfing since the summer of 68 and making boards since 76. I asked him what he loves about surfing. I think it’s the challenge. It’s never the same … so every time you go out it’s always slightly a different version of what you’ve been doing. You know obviously the, sort of, communing with nature, you know, that aspect of it is a strong attraction. Because it is a ... it’s not a team sport, you’re sort of on your own, you know, you have a lot of friends that are with you and you’re out in the water having a good time. But it is that physical attraction of challenging. You can’t equate the force of the ocean, it’s, you know, it’s different every time, it can, you know, punish you, it can, you know, make things easy, it just depends on the day. So the challenge aspect’s really interesting. There’s something about it that is addicting, because it is … you only surf on a wave for 5 to 7 seconds, you know, on an average wave. So, so there’s got to be something, you spend most of the time just paddling around. 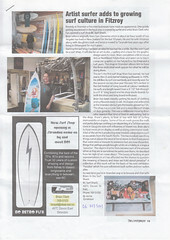 Article published in the TOM Dec/Jan 2009. The headquarters of Kiwi Holiday Parks is also in New Plymouth, so we called in to see them too. I asked where most of the tourists who stay in the parks are from. Probably our biggest market would be Australia. But a lot of UK, from the UK, Netherlands. Germany used to be a big market, but that was prior to the, to the wall coming down. Once that came down the German market slowed up but it’s picking up again now. But it’s certainly not back to the hey day that it was 20-odd years ago. But yeah, no, Australia would be our biggest market, being our closest neighbour. And then would come Europe and the UK. I also asked David if he thought we should book ahead when we stay at Kiwi Holiday Parks. Certain times of the year, just over that Christmas New Year period, possibly. But the benefit of a motorhome is it’s free wheeling, and you can change your mind as you go. And it’s not necessary, not really necessary to pre-book your complete itinerary if you’re travelling by motorhome. We drove around Mount Taranaki to our destination for day 7, a holiday park in Opunake. In Opunake, I sent a postcard to the United States. 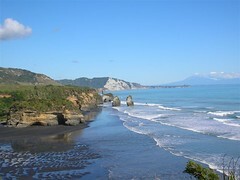 And then we drove down the road to Opunake Beach Holiday Park. It was a really nice place, there was a really friendly vibe and it was right by the beach. We stayed on site number 40. We tried out the microwave in our motorhome to cook this instant rice. I’d never tried instant rice before. It was actually pretty tasty. We drank Mike’s beer while watching the sunset. It was divine.